Samantha gets wasted at a party and ends up sleeping with a stranger. The next day she notices strange things happening to her body. Is it just a hangover? 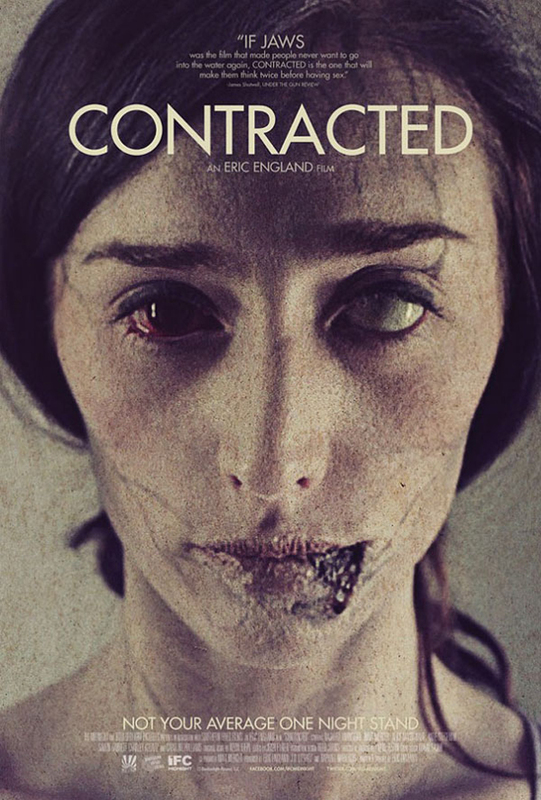 Contracted is about a confused young woman, who is actually a lesbian, but since her girlfriend is giving her the cold shoulder, her best friend fills her up with shots of vodka to make her loosen up, just so Samantha end up highly intoxicated and by herself getting seduced by a man; they end up sleeping together, and of course without any protection. When she notices strange things happening to her body the next day, she doesn’t really do anything about it, and tries to hide it from everyone else. Even when her friend calls her and says the police showed up looking for a strange man, she wouldn’t talk about the events of last night. So everything just just gets worse from here. I am not saying more because I don’t want to give anything away. Fact is, the movie kept me watching, I wanted to turn it off so many times, but I had to know how it ends. HOWEVER, one major issue was that I really didn’t feel sorry for the protagonist. She was the perfect representation of today’s younger generation: Confused, clueless and complicated. But it’s not their life that is complicated, it is actually them who make it complicated for themselves. Not talking about problems seems to be the most common thing, and instead, one gets an answer like, “It’s complicated,”, “You wouldn’t understand.”, or “It’s hard to explain.” And sometimes, all one gets is a blank face, or a simple “Just kidding. Forget it.” For starters, instead of getting wasted, she could face her problems and talk to her girlfriend about their issues, but she rather lets her totally irresponsible friend take care of things and have her getting wasted. Running away from any kind of confrontation is just a trade that I despise, and Samantha seems to do that a lot. and even though it was a great portrait of a lost generation, this was something I didn’t enjoy and couldn’t get over. The whole idea of the movie is very sick, but the outcome could be a great start for a sequel, and the actors were above average. It is definitely not for the squeamish, because what happens to that girl is quite disturbing, and especially at the end they turn it up a notch. I don’t think I would watch it again, because I thought it was quite disgusting for no reason, but still, it was not a bad movie after all. If you watch it, let me know your thoughts about it. Pingback: #MovieMonday – Savaged (2013) – Indie Movie about a murdered Woman who Comes Back For Revenge | Simon Says... WATCH THIS! And you know I am right about the generation thing LoL… That’s exactly what it is … “Partially” good. It is not bad, but it isn’t a milestone either… yet somehow entertaining. If the effects are good I might be willing to give it a view. Sounds a little bit like “Black Hole,” a comic written by Charles Burns about an STD that turns kids into mutants. Well, the idea seems to be the same, and I think the effects are simple yet very effective!! Not really my kind of film, but it doesn’t sound that bad a film, might check it out if I get a chance. I had the worst time watching Teeth or DeadGirl because they were really gruesome, and this one isn’t much different, but I wasn’t totally grossed out by that one. I thought this was going really, really well until the last act. NO ONE would make the decisions these people make – it just fell apart after such a promising premise.